This is an updated version of an article that appeared in the Globe and Mail on September 5, 1992. In July of 1992 I made a trip that most of my life up to then I thought I would never be able to make - to the Baikonur Cosmodrome in the middle of the Kazakhstan desert. As part of the small group of foreigners attending the launch of a three-member crew aboard the Soyuz TM-15 spacecraft, I was able to see at close hand a once-mysterious space program that was trying to adjust to the changes that had swept the former Soviet Union, which had dissolved just seven months prior to my visit. More than two decades later, both the Russian space program and the launch center at Baikonur have defied many expectations and are still in operation. The Mir space station that was the destination for Soyuz TM-15 continued to orbit until 2001. The Soyuz spacecraft now takes crews to the International Space Station (ISS) that Russia operates in cooperation with the United States, the European Space Agency, Japan and Canada. Once one of the mainstays of Soviet glory, the Russian space program has transformed itself into an export industry. The surface contrast between the Russian launching site at Baikonur and its U.S. counterpart at the John F. Kennedy Space Centre in Florida is symptomatic of deeper differences between the Earth's two leading space programs. Since the fall of the Soviet Union, small groups of foreigners take the three-hour flight from Moscow to see the Russian space program at work at an isolated base in a forbidding desert climate. Only a few hundred spectators at most are on hand to watch cosmonauts blast off. By contrast, the launch pads of Cape Canaveral are only a short drive from the biggest theme park complex in the United States. Crowds for shuttle launches have exceeded one million people. Through the 1990s, paid flights by passengers from western countries helped the Mir and Soyuz programs overcome the funding cuts that permanently grounded the Russian space shuttle and other space vehicles. In 2001, the Russians began flying paying tourists aboard Soyuz ferry craft to the ISS, starting with American millionaire Dennis Tito. When the U.S. space shuttle program ended in 2011, Soyuz became the only way for anyone to reach the ISS, and will remain that way until new U.S. spacecraft are rated to carry human passengers. The launching services of the entire Russian rocket fleet have been for sale since the demise of the Soviet Union, along with space for experiments aboard the ISS. Tourists pay top dollar to view launches at the once-secret cosmodrome, or spend a week undergoing cosmonaut training at Star City near Moscow. The name given to the Baikonur Cosmodrome is a holdover from the days of Soviet secrecy and deception. The original Baikonur is in fact a rail stop about 370 kilometres away from the cosmodrome. The Baikonur Cosmodrome was established in 1955 about 30 kilometres from the rail stop of Tyuratam, now known as Leninsk, where most of the workers who service the cosmodrome live. Because the cosmodrome lies in the now independent republic of Kazakhstan, haggling to determine how much of the earnings from the Russian space enterprises at Baikonur go to Kazakhstan have become a part of life. There is also the matter of cleaning up the hundreds of spent rocket stages that fell downrange from Baikonur. Because Russia's other major launch site at Plesetsk is as far north as Yellowknife in the Northwest Territories, it is not well placed to launch communications and other satellites into equatorial orbits. Baikonur, which is at the same latitude as Montreal and Geneva, is still much farther north than Cape Canaveral or the French launching site near the equator at Kourou in French Guiana. In an effort to compete for communications satellite launches, Russian space organizations have built a launch facility for Soyuz rockets at Kourou, and Russian-Ukrainian Zenith rockets are launched from platforms on the equator in the Pacific Ocean in a joint venture with Boeing in the U.S. Despite its northern location, the desert conditions in Baikonur give the place an equatorial feel, at least in late July. At our arrival at the Leninsk airstrip, the temperature topped 40C, the wind was so hot we initially mistook it for the exhaust of another jet on the tarmac, and a dust storm obscured the desert landscape. Driving from Leninsk to our quarters at the Cosmodrome, Boris Lokhmachov, who had worked at Baikonur for nearly 35 years, greeted us with the news that we were in an "ecological disaster area" due to the draining of the nearby Aral Sea for irrigation projects. Water was at a premium. The landscape consisted of sand, brush, tumbleweeds, and camel herds. Humans have imported apartment blocks, radar antennas, and a few trees and domestic animals. There was no sign of the food shortages that had been reported earlier in the year, and no mention of a revolt the previous February by construction troops in the area. The preceding Soyuz launch had taken place in March, and at that time, Baikonur was enveloped in bitter cold, with snow on the ground. We were told that unlike at Cape Canaveral, weather is almost never allowed to interfere with a launch. Even when a storm is blowing, the launching key is turned. It was the eve of the launch of Soyuz TM-15, and except for the presence of our American-based "delegation" of 24 space enthusiasts and professionals, and a much larger French delegation, it seemed to be just another routine summer day at Baikonur. Two of the Soyuz TM-15 cosmonauts, Anatoly Solovyov and Sergei Avdeyev, were flying Soyuz TM-15 to the six-year-old Mir space station and replacing a crew that had been on board since March. They would run the Mir station for six months until a fresh crew relieved them. The third cosmonaut, Michel Tognini of France, would spend a fortnight in space and return from Mir aboard Soyuz TM-14 with the retiring crew. From September 1989 to August 1999, cosmonauts were always on board Mir, and so during the 1990s, Soyuz ferry flights flew regularly to the station to change out crews. Astronauts and cosmonauts have occupied the ISS continuously since November 2000, with Soyuz ferries relied upon to bring crews to the station and back home. The French space agency paid more than $14 million to send Tognini and his package of 12 biomedical and technological experiments to Mir, making the flight of Soyuz TM-15 financially possible for the then financially strapped Russians. The preceding crew made it to Mir accompanied by a German cosmonaut on a flight paid for by the German government. From 1995 to 1998, seven U.S. astronauts flew long duration flights on Mir, with the U.S. space agency paying for the use of the station. Inside the assembly and test building near the Soyuz launch pad, Col. Pyotr Andreiko showed us the backup Soyuz spacecraft and the automatic Progress M-14 spacecraft, which ferried supplies to the Mir station three weeks later. Unlike a similar facility at Cape Canaveral, there were no white coats, hats or boots. While the building was clean and temperature-controlled, nothing like the sterile conditions that are routine for U.S. satellites was maintained. In an adjacent room, we were shown where the cosmonauts would suit up the next day and say farewell to friends and family through a glass partition. The equipment used to verify the integrity of their suits resembled 30-year-old artifacts one sees in U.S. space museums. The next morning, Cosmonauts Solovyov, Avdeyev and Tognini stepped out of the building to take the bus to the launch pad. Most of the crowd that later watched the launch was on hand, and they had been warmed up by French pop music played over loudspeakers. Wearing their white space suits, the three cosmonauts saluted a military official, and Solovyov reported that his crew was ready to fly. Then the three stepped into the bus. The French delegation, including a uniformed gaggle of teenagers from a French space camp, posed with Patrick Baudry, who flew on the U.S. space shuttle, and Jean-Pierre Haignere, Mr. Tognini's backup. Nearly three hours later, just after noon, the twin gantries that had sandwiched Soyuz TM-15 and its rocket tilted away. At the planned launching time, the loudspeaker barked "firing command" in Russian. A throaty hiss announced that the five engines at the base of the 50-metre-high rocket had ignited. Finally, smoke emerged from the flame pit behind the rocket, and a flash signified that the Soyuz TM-15 was on its way. The petal-shaped hold-down arms at the base of the rocket fell back, and a brilliant flame came into view as the full roar of the engines reached the viewing stand a kilometer away. Soon sunlight glinted off the rocket as it tilted eastward toward the correct orbital path. The rocket faded, leaving only its starlike flame in view. Two minutes after launch, the star disappeared, and a only few puffs of smoke were left in the sky. A few minutes later, the spectators cheered when the loudspeaker announced that Soyuz TM-15 was in orbit. Except for those who paused to buy stamps, cards or pins from a makeshift souvenir stand, the crowd quickly dispersed and the routine of Baikonur was quickly re-established. Soyuz TM-15 was the 342nd launch from what is called the Soyuz or Gagarin pad. Among those launches were the first satellite, Sputnik 1 in 1957, the first human in space, Yuri Gagarin in 1961, and all but two of the Russian launches with men (and only a handful of women) aboard that have followed. The launching pad has also been rebuilt after several major accidents. In 1983, a two-man Soyuz crew safely escaped using the escape rocket attached to their capsule when the booster rocket blew up on the pad. The flame pit beneath the pad was dotted with metal debris from rockets and discarded equipment. The flame pit is only cleaned out once a year, we were told. A vacationing worker from a Kennedy Space Centre contractor picked up a beat-up wrench and said, "if someone had left this behind on a pad at the Cape, he'd be out of a job." The Soviet space program stands on tradition and using proven, and by U.S. standards, primitive, technology. The Soyuz rocket is a derivative of the same rocket (nicknamed "semyorka," for "old number seven") that served as the first Soviet intercontinental ballistic missile and as the launcher for Sputnik and Gagarin. The Soyuz spacecraft first flew in 1967. Soyuz TM-15, the 70th acknowledged Soyuz flight, was a third-generation Soyuz craft that in its basic design was little changed from the original. An updated and roomier fourth generation of Soyuz known as Soyuz TMA was introduced in 2002, replacing Soyuz TM after 35 flights. Since 2010, the updated Soyuz TMA-M spacecraft has carried crews to the ISS. The Soyuz TM-16 spacecraft being prepared for launch. When Soyuz 19 docked with an American Apollo spacecraft in 1975, many American experts criticized its primitive features, which they compared to the U.S. Gemini spacecraft of the 1960s. But the rough-hewn Soyuz attained a degree of vindication in the 1990s when the Americans and the Russians agreed to use Soyuz as a "lifeboat" and ferry craft for the ISS. During the hiatus in shuttle flights following the Columbia shuttle disaster of 2003, and since the shuttle program ended in 2011, Soyuz has been the only means of getting to and from the ISS. Cosmonauts Solovyov and Avdeyev were making some space history that day. Avdeyev was departing on the first of three flights to Mir that would see him travel nearly half a billion kilometers while spending more than 747 days in space. Avdeyev held the title of the world's most experienced space traveler until 2005. In his five flights to Mir, of which Soyuz TM-15 was the third, Solovyov spent 651 days in space and set the record for most time walking in space - 79 hours. His fourth flight to Mir would be aboard a space shuttle and his final flight included repairs to the troubled station resulting from a collision by a Progress cargo ship. Within sight of the Soyuz launching complex are the gigantic assembly and test buildings for the Energia rocket, the most powerful rocket available today, and the Russian space shuttle, Buran. Touring the buildings, we were shown Energia rockets ready for flight, and two shuttles, along with two shuttle test vehicles. Energia flew only twice, first in 1987 on a test flight with a mysterious payload later revealed to be a test of anti-missile defense systems, and then in 1988, carrying the shuttle Buran. The shuttle, which had no crew on board, landed by remote control at Baikonur after two orbits of the earth. Like its American counterpart the Soviet shuttle was launched in a blaze of controversy. Critics charged that Buran had no use and was built only because the Americans had a shuttle. Buran looked almost identical to its American counterpart. But unlike the U.S. shuttle craft, its launching system was separate from the orbiter. The Energia rocket that boosted Buran could be used to launch other massive payloads. One reason the Soviets decided to build their own shuttle was that the U.S. Defense Department was heavily involved in the shuttle program prior to the Challenger disaster in 1986, and the U.S. shuttle design reflected demands from the U.S. Air Force. We were told that Energia was slated to launch a "communications platform" in 1993, but Energia and Buran were instead permanently mothballed that year. Buran test articles found their way to Gorky Park in Moscow and to Australia, and Buran itself was destroyed when the roof of its storage building collapsed in May 2002. Near the assembly buildings were two launching pads for Energia and Buran. Two other pads for Energia were further north. When members of our group asked to go up the tower of one of the Energia-Buran launch pads, we were taken the following morning up the tower aboard a funicular railcar with 16 seats which resembled a ride at Disneyworld - minus the drop at the end. Like the Energia assembly building, the pads were originally built in the 1960s for the gigantic N-1 booster that was supposed to ensure that the first man on the moon carried a hammer-and-sickle flag instead of the stars and stripes. At the time of our visit, the Soviet moon program was emerging from the mystery that had enveloped it for a quarter century. 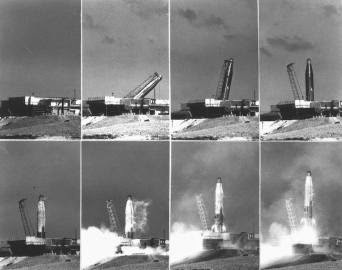 Four N-1 launch attempts between 1968 and 1972 ended in failure, and the lunar program was cancelled as a result of those failures. For years, the Soviets denied that they had a program to put cosmonauts on the Moon. We were among the first to see some photos of the N-1. Since then, the Russians revealed more information about their lunar programs, including one program to put cosmonauts on a trajectory around the Moon and back home in a variant of the Soyuz spacecraft, and a second program to land a cosmonaut on the surface of the Moon in a one-man lunar module. Although the infrastructure for the N-1 still stood despite being converted for use by Energia, the only sign we saw of the rocket itself were three quonset huts near our quarters at Baikonur, which were made from unused N-1 payload shrouds. "We had some problems with the rocket carrier and later some financial problems, and so the program was canceled," we were later told by Cosmonaut Pyotr Klimuk, who trained for a Moon flight in the 1960s. When the Soviets were beaten to the moon, they turned to space stations. Soviet and Russian cosmonauts have stayed in space for long as 14 months at a time aboard a string of Salyut stations in the 1970s and early 1980s, and between 1986 and 2001, aboard the Mir station. After touring Baikonur, our group visited the Yuri Gagarin Cosmonaut Training Centre in Star City, northeast of Moscow, and the Spaceflight Control Centre in the Moscow suburb of Kaliningrad, now known as Korolev, where we watched Soyuz TM-15 dock with Mir. At the control centre, Cosmonaut Klimuk, an air force general who was the director of the training centre, tried to put the best face on the future of his program when I asked him for comment. "We just signed contracts with the United States and France for future manned mutual flights," Gen. Klimuk said through an interpreter. "It's difficult but the work is still very good." Cosmonaut Alexander Serebrov spoke in English of his visit to the Johnson Space Center in Houston, Texas, where he tried the American version of the Russian space maneuvering unit he was the first to fly in space. He judged the American unit to be more powerful. When asked what type of camera he would like to take into space, Mr. Serebrov said he would like to take the Canadian-developed Imax motion picture camera to Mir. Imax cameras later made it to Mir when U.S. space shuttles flew to Mir between 1995 and 1998. In 1992, the former Soviet design bureaucracies were converting themselves into enterprises to build and sell the products they once produced exclusively for the Soviet government. The S.P. Korolev Rocket and Space Corporation Energia, which includes the former design bureau of Sergei Korolev, the "father" of the Soviet space program, is selling flights of experiments and humans aboard Soyuz, Zenith and other Russian rockets and spacecraft. Another large space business is the Khrunichev Enterprise, which manufactures the Proton rocket, which aside from the N-1 and Energia was the largest rocket made by the Russians. 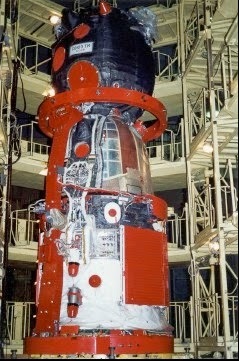 The Mir station and its modules were also manufactured at the plant in Moscow. Alexander Kondratyev, a rocket engineer who was then the head of Khrunichev's foreign economic relations department, led a tour of his plant in Moscow, which until 1989 was closed to foreigners. Proton rockets on the assembly line at the Khrunichev Plant in Moscow. Tough competition from U. S., European and Chinese competitors, along with U.S. security regulations, had frustrated efforts to sell Russian launch services. After our visit, Khrunichev formed an alliance with U.S. aerospace giant Lockheed Martin to sell Proton launches, and today Proton has a share of the world commercial launch market. Competition existed within the Soviet program and continues today in Russia. The launching pads for Proton at Baikonur are located more than 20 km away from the Soyuz and Energia pads because they have always been produced by rival organizations. With the end of the Soviet Union, critics of the Russian space program were freed to make their points. In a commentary on the launch of Soyuz TM-15, Pravda, which once proudly trumpeted Soviet space spectaculars, asked on its front page if spending on space is worthwhile. Earlier that year, the Moscow News carried an article on the death of Cosmonaut Vladimir Komarov aboard Soyuz-1 in 1967, which analyst Leonard Nikishin blamed on the Soviet Union's "ambitious and arrogant elite" who used the space program to better propagandize the socialist system. "Those who insist on the continuation of manned flights today, and bemoan the death of the space program and the waste of experience should not be believed," Mr. Nikishin said. "The efforts of the really top-notch experts should be switched away from the more useless and wasteful projects to those which can benefit people and the economy." These criticisms were just part of the evidence that the Russian space program, once the pride of the Soviet Union, had fallen in public esteem. In Soviet times, tourists from around the country thronged the Cosmos building at the Exhibition of Economic Achievements in the north end of Moscow to inspect models of Soviet spacecraft. The permanent exhibition marked one of the few openings in a secretive but high profile space program. By 1992 the program's secrecy was gone, many of those models on show had been taken down, and the Cosmos building was converted to use for dances and to sell cars. In the years since 1992, the Russian space program has worked to overcome the criticism of those such as Mr. Nikishin. Its efforts to entice foreign customers through joint ventures have had a good degree of success. Although the Russian space program was forced to give up its dream of keeping Mir flying or of replacing it with Mir 2, the Russians have made critical contributions to the ISS. The U.S. government heavily subsidized the Russian role in the ISS during the Russia's period of economic turmoil in the 1990s, a fact that brought a great deal of fire from American critics of the space station. Whatever the downsides of the American subsidies, they kept alive the world's oldest space program, one that has followed a different path from its American and European counterparts. The basic brute force methods of the Russians have provided useful lessons for other spacefarers. On December 11, I wrote about the Centre of the Universe astronomy educational centre near Victoria at the Dominion Astrophysical Observatory. The National Research Council of Canada had closed down the Centre of the Universe last August, accompanied by a lot of controversy in Victoria and elsewhere. By the time I wrote about this in December, an effort by various community groups and individuals had led to a plan to reopen the Centre of the Universe under new management this summer. On Saturday May 3, when the Victoria Centre of the Royal Astronomical Society of Canada observed International Astronomy Day, the public returned to the Centre of the Universe for the first time since its closure. Daytime activities had taken place at the Royal B.C. Museum, and evening activities for the public, including talks inside the Centre of the Universe building and tours of the historic Plaskett Telescope, took place at the Dominion Astrophysical Observatory. 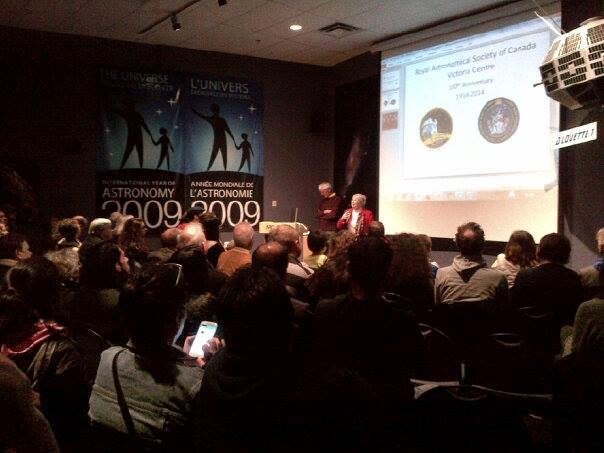 The weather didn't cooperate with our plans for observing, but more than 200 members of the public came to the CU anyway. I was pleased to lead one of the tours of the 1.8 m Plaskett Telescope, which this year is celebrating the centennial of the beginning of its construction. Among those present that evening were Don Moffatt, whose petition last summer drew public attention to the closure of the CU, and Lana Popham, the Member of the B.C. Legislative Assembly who has given strong support to community efforts to revive the CU. The strong attendance was a powerful endorsement of the efforts of those working to keep the CU going. Further Saturday night observing sessions will take place this summer - rain or shine - on July 5, 12 and 19, August 2, 9 and 16, and September 6. These events will begin in the evening and include tours of the Plaskett Telescope and observing the night sky. The CU itself won't be open on these evenings, because it will be used by the University of Victoria's Science Venture program to offer week-long camp programs to kids in Grades 3 to 8 during the summer. Enrolment is still open! While the CU is open this summer, much more work needs to be done to flesh out a long-term plan to keep the CU open in the years following this one. While the NRC has agreed to provide limited support to the CU in the future, a new organization will have to run the CU. I hope that this organization will soon be up and running. I will continue to write about the efforts to revive the Centre of the Universe as events warrant. I enjoy visiting the launching sites and control and training centres associated with space travel, wherever they are. Like many people, I have visited the Kennedy Space Center and other NASA sites around the United States, and I have also been to the Baikonur Cosmodrome in the desert wastes of Kazakhstan. In April I was finally able to visit the world's original space facility, at Peenemünde on the Baltic coast of Germany, where the German military developed the V-1 and V-2 "revenge weapons" of World War II. The V-1 was the "doodle bug" cruise missile, and the V-2 was the first long-range ballistic missile that was the forerunner of today's space launch vehicles. A visit to Peenemünde is guaranteed to be different from any other space-related destination because of its dark association with Germany's Nazi regime. It is located close to the German border with Poland on the Baltic island of Usedom, which is known for its resorts along its beaches. German space enthusiasts began experimenting with rockets in the 1920s, and when the German army got involved in rocket research in 1932 just before Adolf Hitler took power, they tested rockets near Berlin. In 1936, the German army's team of rocket engineers headed by Wernher von Braun transferred their work to the seaside location of Peenemünde, displacing a sleepy fishing village. There on October 3, 1942, a V-2 rocket became the first human-made object to escape Earth's atmosphere and fly into space, albeit briefly. Nearby air force experts were creating the V-1, and the area quickly became covered with test stands for the new weapons and gigantic production facilities for the V-2 rocket. The top leaders of the Nazi regime, with the exception of Hitler, came to Peenemünde to see the new wonder weapons in person, and slave labour began to be used to produce the rockets. V-2 rocket motor in Peenemünde museum. But the growing facility also began to attract the interest of the Allies, and on the night of August 17, 1943, massive waves of British RAF bombers did serious damage to Peenemünde. Most of the top people survived, but the feared SS or Schutzstaffel paramilitary force under the leadership of Heinrich Himmler used the raid as an excuse to wrest production of the V-2 from the army. The SS won control, and production was transferred to an underground production facility in the Harz Mountains using labour from the notorious Dora-Mittelbau concentration camp. Von Braun and leading engineers remained at Peenemünde until near the end of the war in 1945, when they left to ultimately surrender to American forces in the Bavarian Alps. Peenemünde itself came under the control of Russian forces, and the facility became a base for the East German air force and navy that closed not long after reunification of East and West Germany in 1991. While von Braun became a popular personality in Cold War America, the East German regime looked down on his Nazi links, as many more would also do after his death in 1977, so the damaged remains of the Peenemünde rocket facilities were neglected during the existence of East Germany. A plan to celebrate the 50th anniversary of the first successful V-2 flight in 1992 after reunification was halted due to what one writer called a "veritable wave of indignation." But finally in 2000 a "Historical Technical Museum" was opened inside the rocket facility's power plant, which had remained in operation during the Cold War. It was the stark museum in the darkened power plant that I visited in April. Peenemünde is nearly four hours by rail from Berlin, and while it is possible to stay in the town next to the museum, there is a greater variety of accommodations in the resort town of Zinnowitz, which is a 15-minute rail ride away. The power plant contains two permanent exhibitions - one on the development of rockets at Peenemünde and another on the power plant itself. Temporary exhibitions are also mounted - at present there is an exhibition on the British operations against Peenemünde and other rocket facilities known as Operation Crossbow. Most of the exhibits are presented in German only, but there is enough information in English for an interested person. The museum contains artifacts from the rockets and from the people who built them, alongside photographs and models of the launch facilities. Outside the museum there are full-scale models of the V-1 and V-2. The museum presents the successes of the rockets alongside the pain and suffering they also inspired - both that felt by the people targeted by this weapon and those slave and concentration camp labourers who gave up their health and their lives while building these rockets. The museum, in the word used in its website, explores the "ambivalence" of the technical breakthroughs of Peenemünde. A museum presenting such "ambivalence" is not the largest tourist draw, and this has caused financial problems for the museum at Peenemünde. Moreover, the test stands where the historic launches took place are off limits due to the fact that those areas have not been fully swept for leftover ordnance. I visited on a sunny Sunday afternoon, and the museum was nowhere near crowded, and neither were nearby private attractions, including a Soviet submarine. Today the legacy of Peenemünde is looked at more critically than it was during the Cold War. A number of schools in West Germany, for example, were named after Wernher von Braun. Just a few weeks before my visit, von Braun's name was removed from the last German school to bear his name. Today the von Braun name is honoured only in his former American home of Huntsville, Alabama, and a lonely sign on the outskirts of Peenemünde notes its twin city relationship with Huntsville. My visit to Peenemünde was a fascinating and thought-provoking experience. Humanity's reach into space was opened in the service of its darkest regime, leaving a trail of "ambivalence" in its wake. Inside the Peenemünde Power Plant. In recent years my historical research has focused on American military missile programs during the first decade after the end of World War II. When this topic comes up, many people instantly think of Wernher von Braun and the rocket experts he brought with him from Germany after he surrendered to American forces in 1945. A decade later, von Braun and his team were in Huntsville, Alabama, building the Redstone missile for the U.S. Army. And while the Redstone did play an important role in the early space race, I would argue that the action was elsewhere. The major missile program in the United States in the 1950s was the U.S. Air Force program to develop Atlas, America's first Intercontinental Ballistic Missile (ICBM). Along with the air force Titan ICBM and Thor missiles that quickly followed it, Atlas formed the centrepiece of America's nuclear deterrent in the early 1960s. As well, Atlas, Titan and Thor carried the overwhelming majority of U.S. satellites and spacecraft into orbit and beyond from the late 1950s up to the late 1990s. Atlas rockets carried the first American astronauts into orbit, most of the American spacecraft that preceded Apollo to the Moon, and the first wave of spacecraft that explored the solar system. Without the air force decision to proceed with Atlas in 1954, the U.S. would not have had much of a space program in the 1960s. Yet Atlas has been lost in the controversy that followed the Soviet Union's use of their own ICBM to launch the first artificial satellite, Sputnik, into orbit ahead of the U.S., and the historical emphasis placed on Wernher von Braun. My work on Atlas was the topic of my address last month in Berlin to the Embattled Heavens conference on the military influence on space exploration - a conference I discussed in this blog last week. For many years, the U.S. Air Force was criticized for waiting until 1954 to start on Atlas. I found this idea of air force hesitation to be strange, given that the U.S. military during the Cold War was notorious for promoting almost any and all weapons programs. My re-examination of the early years of the Cold War suggests that air force behaviour with Atlas was consistent with its usual support of new weapons. I argued that developments in nuclear weapons drove development of both Atlas and the first Soviet ICBM, the R-7, and that the space race of the 1960s was a product of the race to develop nuclear weapons after World War II. Many popular accounts have stressed the scientific roots of the race into space, along with the idea that going into space was hugely popular with the public. More recent research has pointed out that while space programs do have public support, many Americans felt that the massive sums spent on Apollo in the 1960s would have been better spent on other things, a fact that politicians picked up on when they curtailed Apollo after six landings on the Moon. My own research shows that the infrastructure of early space travel was built first to support nuclear weapons. Historian Alex Roland, who also spoke at the Embattled Heavens conference, has long argued that the controversy that followed the launch of Sputnik in 1957 was a turning point in the U.S. military's quest to mobilize the civilian economy in the service of military priorities. The idea fostered by some historians that the U.S. Air Force dragged its heels on Atlas has been thrown into question, and I argue that this mistaken idea also fed into the military quest for more weapons. 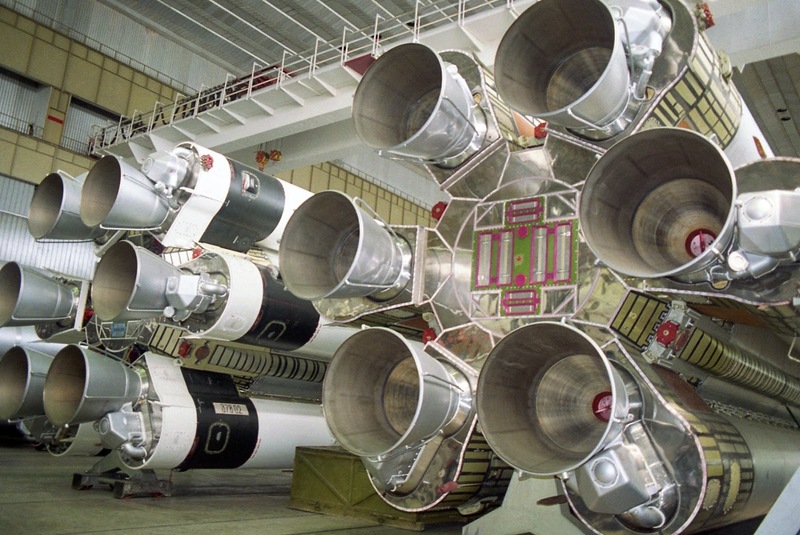 To better understand how space exploration has evolved, we must look honestly at what was behind the development of the first space launch vehicles. I believe that it was nuclear weapons, not love of space travel, that drove their creation. If the creation of nuclear weapons had not led to ICBMs in the late 1950s, the reach into space that followed would have been quite different. For example, we might still be waiting today for the first human footprints on the Moon. And there would also be many other consequences, both good and bad, including the state of technology in our society today.